What do Animals do in Storms? 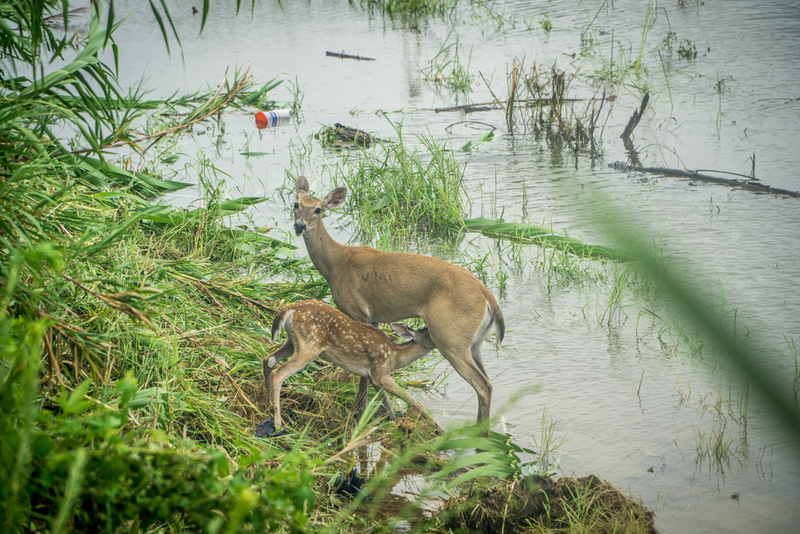 White-tailed deer in aftermath of Hurricane Harvey. Image by Eric Overton at Shutterstock. With the recent hit of Hurricane Florence, we’ve been asked a few times how wildlife can survive such catastrophic events. Where do animals go? Can they survive the winds, the rain, and the flooding if they get stuck? The answer is a bit more tricky than a ‘yes’ or ‘no’. Some animals can avoid hurricanes fairly easily. There are certain bird species that are able to sense the drops in barometric pressure that occur right before a storm, and can fly to safer regions to avoid the worst of the weather. During Hurricane Irma in 2017, the American Bird Conservancy reported that many flamingos that had left Caribbean islands before the storm hit returned to the area after the hurricane had past. Scientists have also observed sharks of various species fleeing from major weather events. However, not all animals react to pre-weather indicators, and, for those that cannot or do not find shelter, hurricanes can be catastrophic. Many migratory birds traveling to their wintering grounds can get blown extremely off course by hurricane winds. Wildlife biologists have observed birds native to Florida showing up all the way in New Jersey! Getting back on track can take these birds days or even weeks, and, for those seriously injured or weakened after the event, getting back on course can be impossible. Surprisingly, even fish can be negatively affected by large storms – significant amounts of rainfall can decrease dissolved oxygen levels in water, and sediment runoff can destroy aquatic habitats. This also goes for freshwater mussels, which have undergone large population depletions across the state in recent years. Even for those able to find shelter in burrows, any critter bunkering down below the flood line can drown in their underground escapes. Baby animals are also at risk. Baby squirrels, or kits, can get blown from their mother’s nests. 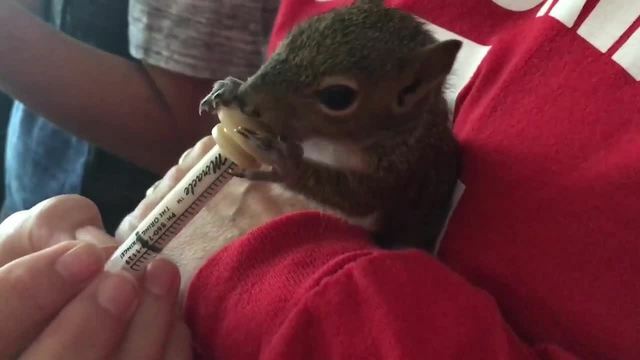 Thus, wildlife hospitals tend to get a huge influx of squirrel kits right after large storms. If you encounter an orphaned squirrel or other wildlife, please contact a licensed rehabilitator for instructions on care. Do not try to feed it, as this usually causes more harm than good to the animals. A list of licensed rehabilitators can be found at www.ncwildlife.org/have-a-probem. Squirrels are also vulnerable to hurricane impacts since strong winds can wipe out the species’ main food source , nuts and acorns. This is the same for white-tailed deer, black bears, and wild turkey; even though downed vegetation can be a great food source directly after a hurricane, food will be much more scarce in later seasons. Baby squirrel at a Tampa wildlife hospital after Hurricane Irma. Photo by ABC Action News. Endangered species can often have entire populations wiped out from large weather events. Coral reefs can take years to recover after damage from hurricanes. Back in 2017, Hurricane Harvey killed what appeared to be hundreds of Mexican free-tailed bats. Individuals were seen floating, dead, on top of flood waters across the state of Texas. This particular species is not threatened, but there are several endangered bats in North Carolina that could undergo serious population declines that could affect the status of the overall species. The gray bat, Indiana bat, and Northern long-eared bat are just three NC native bat species that are currently listed under the United State’s Endangered Species Act that could have been negatively impacted by Hurricane Florence. Thus, you’ll often see wildlife biologists hurry on-scene following catastrophic events such as these to survey the surviving populations of such delicate species. It may be surprising to hear that there are some species that can actually benefit from hurricane damage. Similar to wildfires, hurricanes can open up habitats to new vegetation growth, which can allow certain plants to thrive. Raccoons and various amphibians are examples of two animals that tend to do very well after a large weather event. Since raccoons are scavengers, they are able to find many new food sources after the turmoil from a hurricane. Many amphibians, such as frogs, are able to use large rainfall events to breed and provide ample habitat for their young. 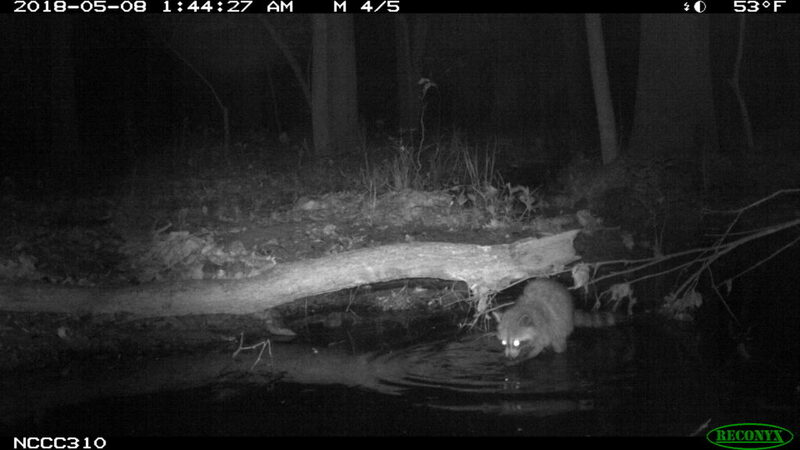 Raccoon captured on Candid Critters camera while scavenging for food at Falls Lake. In the end, there are just as many, if not more, species that have been hit hard by Hurricane Florence as there are species that were able to avoid or benefit from the storm. Many animals could benefit from the efforts of those currently working on wildlife disaster recovery efforts. If you’d like to help nature in its healing process, you can donate to a number of wildlife hospitals and sanctuaries located across the eastern portion of North Carolina.